Birr's Justin Kehoe is the best of the Irish hopefuls at the halfway stage of the European Tour Qualifying School First Stage (Section A). The former South of Ireland champion is tied for eighth place at Dundonald Links in Scotland after a second round 73, just four shots behind leader Craig Goodfellow. The top 26 and ties will progress from Dundonald to Stage Two with Daniel Sugrue, Barrie Trainor, Mark Staunton and Mark Murphy on track to make it. Lurgan's Gareth Shaw slipped one stroke outside the seven-over par qualifying mark when he followed his opening 72 with an 80 in tough conditions. Glen Robinson is the only Irish contender inside the top 30 and ties to qualify at Chart Hills in Kent there are 33 players at three-under par or better. First round leader Oskar Henningsson of Sweden remained in front after adding a second round 69 to his opening 63 for a 12 under par 132 aggregate. At Fleesensee in Germany, Sweden’s Jens Dantrop leads the way with an incredible two round aggregate of 15-under par 129 after adding a brilliant second round of ten-under 62 to his opening 67. Stackstown's Michael McDermott is three shots outside the five-under par qualifying mark for the top 30 and ties with Mallow's Mervyn Owens a shot further back on one-under par after a 75. T58 Michael McDermott Irl 70 72. T70 Mervyn Owens Irl 68 75. Six of Ireland’s 22 aspirants are on course to progress through the First Stage (Section A) of the European Tour Qualifying School. Lurgan’s Gareth Shaw hit a level par 72 to share second place at windlashed Dundonald as Galway’s Mark O'Sullivan cracked a six-under par 66 at Chart Hills to grab a share of third. Talk about a bad day at the office. Stephen GrantAs PQ1 (Section A) reached the halfway stage at four venues in England, Scotland, Portugal and Denmark, all 12 Irish hopefuls are outside the qualifying places. Barrie Trainor is the best of the bunch but a second round 78 at Dundonald Links relegated the Warrenpoint man from fifth to tied 23rd, one stroke outside the top 20 who will progress to stage two from that venue after four rounds. David Higgins, Eddie Barr and Mervyn Owens were the best of the bunch as eight of Ireland’s 25-strong contingent broke par on the in the first round of The European Tour First Qualifying Stage – Section B.
David HigginsWaterville man Higgins, 36, fired a four under par 68 to share second place at the Oxfordshire, a stroke behind Scot Gavin Dear, with St Margaret’s John Kelly and Mallow's Michael Collins tied for ninth after two under par 70s. 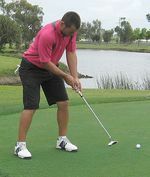 Australia based Barr hit a four under par 68 at Golf de Moliets in France where former European Tour player, Olivier David is leading after an opening 64. Barr is joint 14th while Limerick’s Cian McNamara and Newbridge man Paul O’Hanlon made positive starts with one under 71s leaving them tied 30th. Former South of Ireland champion Owens, who plays regularly on the EPD mini tour in Germany, lit it up at Fleesensee G&C near Berlin with a five under 67 as Walker Cup star Niall Kearney opened with an excellent 71. Gary Murphy in action at the Irish Open this year. Photo Fran Caffrey/www.golffile.ieGary Murphy started well but former Walker Cup player Jonny Caldwell is just one stroke off the pace after a marathon day at Stage One of the European Tour Qualifying School at Dundonald Links. The 16th at Dundonald Links. 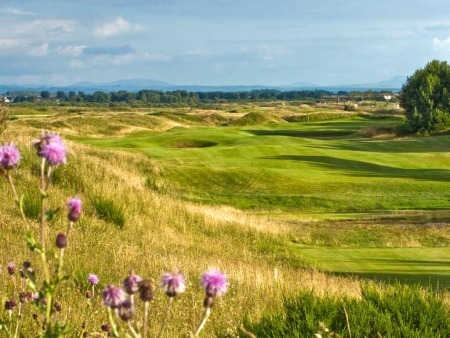 Five of the 10 Irish entrants are poised to progress with Clandeboye’s Jonny Caldwell and Scottish amateur Philip McLean tied for the lead with a round to play in the First Stage of the European Tour Qualifying School at Dundonald Links.